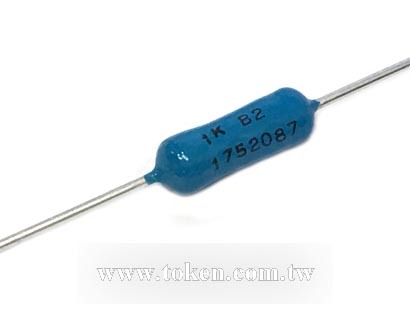 The (RE) Series from Token Electronics is capped ultra precision metal-film resistors, as well as a complete selection of MIL-PRF-55182 and GJB244A-2001 quality standards. Token offers a low-cost alternative to traditional solutions for precision applications. The (RE) is available in a resistance range of 10Ω ~ 10MΩ with a precision tolerance of ±0.01% and a temperature coefficient of resistance (TCR) of ±2PPM/°C, although other tolerances and TCRs are available. The resistance element in these devices is a precisely controlled thin film of metal alloy deposited on a high quality alumina substrate. Plated caps are force-fitted before the assembly is trimmed using advanced laser techniques to ensure excellent performance and low electrical noise. Leads are welded to the end caps prior to the resistor being coated with epoxy. Products equate Vishay, Ohmite, Caddock, IRC, EBG, Panasonic Precision Devices with more competitive price and fast delivery. Detailed precision (RE) specifications, both mechanical and electrical, please contact our sales representative for more information. Production Standard: Which is made referencing to Chinese National Quality Standard GJB244A-2001 standards, and USA Military/Established Reliability MIL-PRF-55182 in environmental and dimensional requirements. PDF download here Ultra Precision Resistor (RE). ± 2.0 % maximum ΔR in 10000 hr load life. + 175°C maximum operating temperature. Measuring and calibration equipment, Test and measurement. 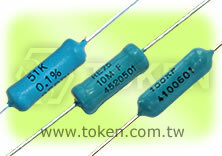 Power rating from 0.125W to 1.5W. Military/Established Reliability and Stability. Extreme precision tolerance tight to ±0.01%. Temperature coefficient narrowed to ±2PPM/°C. Industrial grades, RoHS Compliant, metal film lacquer coated. Covers all general type precision resistive products. Please contact Token's Representatives if your requirement is not in above range.